Guys, if you are looking for new outfits or looking to update your wardrobe, look no further than The D Store. Ladies, they have a collection for you as well. And it all starts at INR 500. This non-descript store is quite easy to miss if you don’t keep a sharp eye out for the black signboard screaming its name. But once you spot The D Store, it’ll be your BFF. 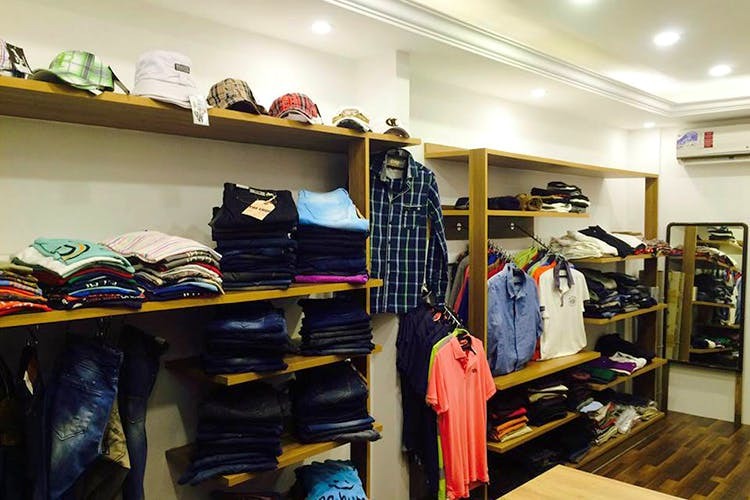 Shirts, tees, jeans, trousers, chinos, and accessories such as snapback caps, sunglasses, and wristbands are what will catch your eye in the men’s section. We browsed around the men’s section and found an extensive collection of shirts in checkered, solid, floral, and striped designs for men. The brands (tags are attached) that we spotted from the lot included Zara Men, United Colors of Benetton, Jack & Jones, Adidas Originals, Scotch & Soda, and Calvin Klein. All sizes are available, so hurrah for that. Need a new pair of jeans? You can take your pick from brands such as Gas, UCB, CK, and Zara Men. For once, the men’s collection is better than the ladies’. But they do stock tops, denim shorts, jeans and accessories such as handbags and sunglasses for the girls too. The store also has a 40 to 50 per cent discount from time to time, so be sure to check that out.